At 8:00 a.m. 3rd of April, the officers from the Centre Against Extremism came with a search warrant to 4 addresses of Kazan antifascists. 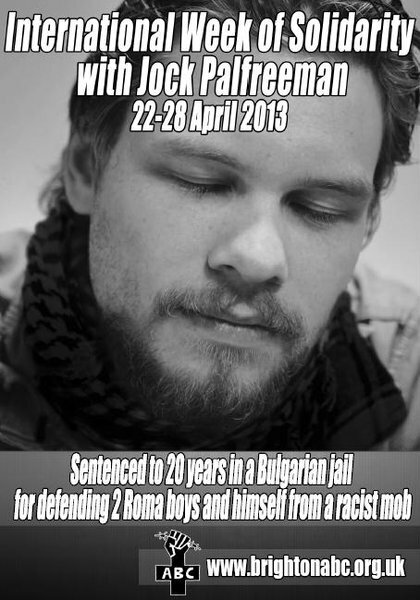 Jock Palfreeman is an Australian who, on the 27th December 2007, on a night out in Sofia, Bulgaria; had the courage to stand up against a group of fascist hooligans. Witnessing the fascists chasing and attacking two young Roma boys, Jock ran to the boys’ aid. He did his best to keep the fascists at bay but they ended up turning on and attacking him. Left with nowhere to run, Jock had no choice but to defend himself. Andrey Monov, one of the racist gang, was stabbed and later died. Another, Anton Zahariev was injured. The Roma boys ran away. Jock has since been tried and sentenced for murder and attempted murder. He was sentenced to 20 years imprisonment and has been given a fine running into hundreds of thousands of dollars.